I was hoping for a bit of winter warmth in Gran Canaria but though folks in the hotel where I am staying are determinedly lying round the pool on sun loungers, I am made of less hardy stuff. The temperature is allegedly around 19C, but, with quite a stiff breeze and quite a few clouds, it feels colder than that. It needs to be over 25 degrees minimum and sunny before I start to consider getting my kit off. But at least the art around here is hot. 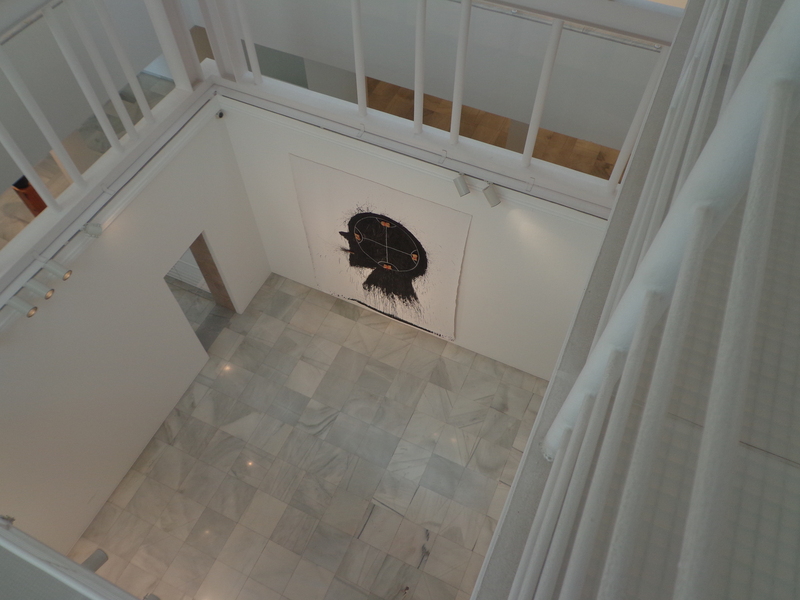 I have just visited the 25 Anniversary Exhibition, Cruce de Colleciones (A Crossroad of Collections), at the Centro Atlántico de Arte Moderno CAAM in Las Palmas. It was worth the journey just for that. CAAM first opened in 1989 with the aim of celebrating what they call tri-continentality: the archipelago’s position as the cultural crossroads between three continents: Europe, Africa and America . 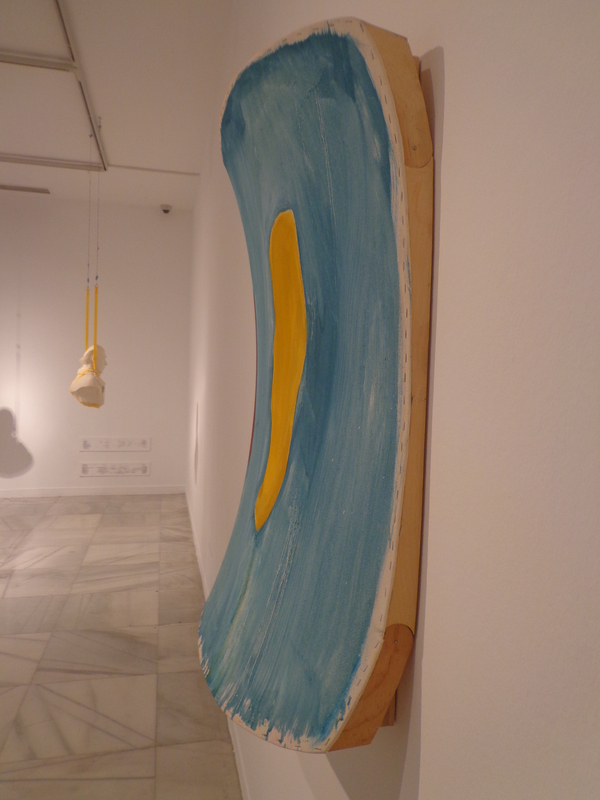 Since then it has considerably expanded both its collection and the exhibition space. 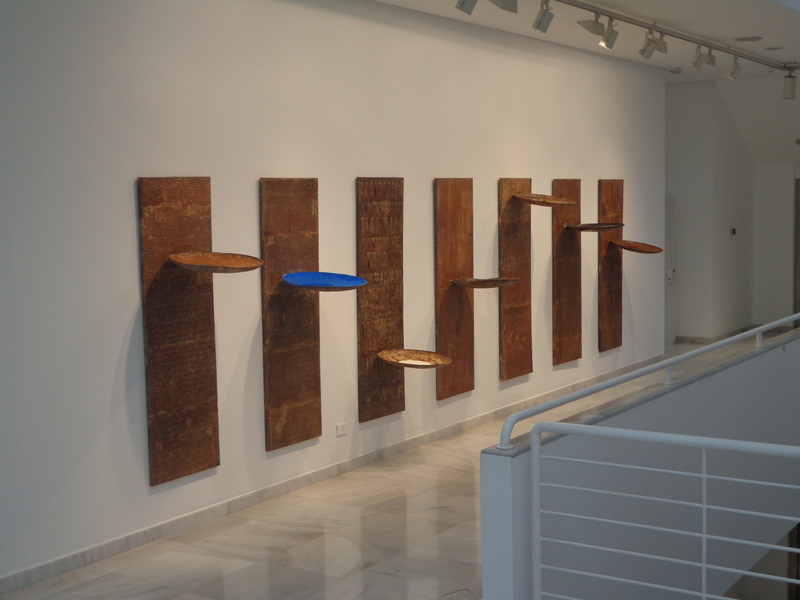 The exhibition features work by 105 artists. The staff are enthusiastic welcoming and, unusually, they volunteered that I could take photographs, so no dour faced photo police. The buildings in which the collection is housed are a delight, There is the original nobleman’s house as well as an exciting modern exhibition halls which provide unexpected views of the art on display. 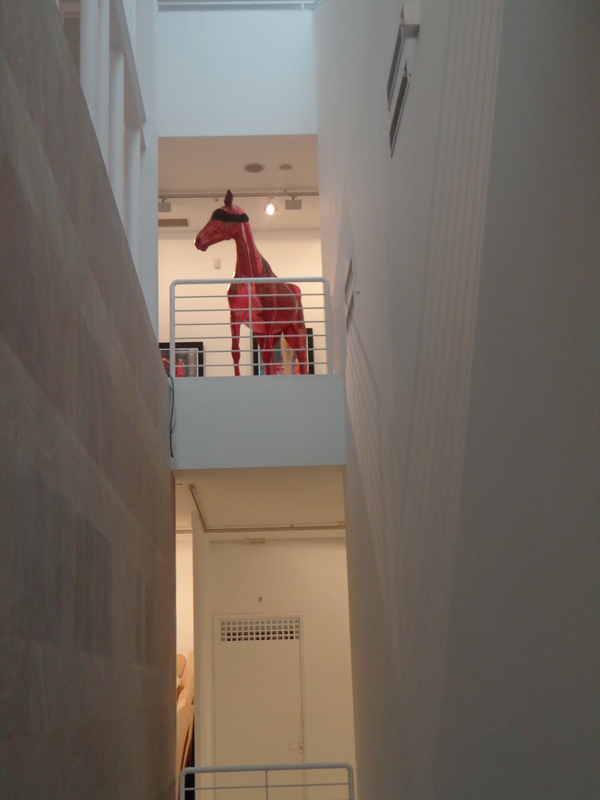 Look at these views of Marina Vargas’ splendid horse sculpture seen from below and Jose Bedia’s painting Malos Pensamientos seen from above and you can see how it draws you in. So much there was excellent and all so well displayed that it was almost impossible to select pieces to write about. Here in the spirit of tri-continentality is something from each continent. From Africa was this striking piece by Zimbabwean artist Berry Bickle, Inzima. My one criticism of CAAM is that it tells you too little about the artworks and the artists. 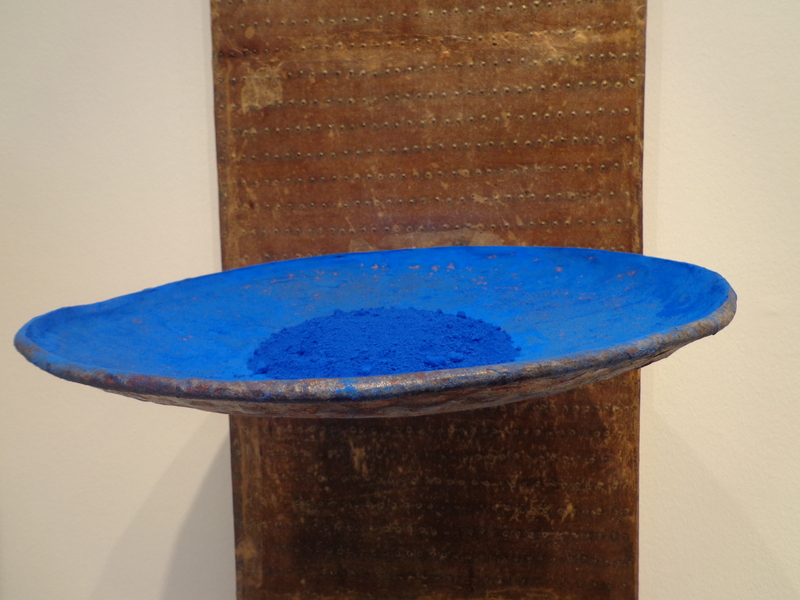 The information is limited to just a name and a date, in this case 2000, not the nationality of the artist, nor the materials used. An internet search about this work has also revealed nothing. Google Translate provided the information that Inzima means is a difficult in Zulu. We seem to be missing a noun or at least an it. I am currently researching non rectangular paintings so my choice from America was this curved work from Ron Gorchov, Androcles, 2011. 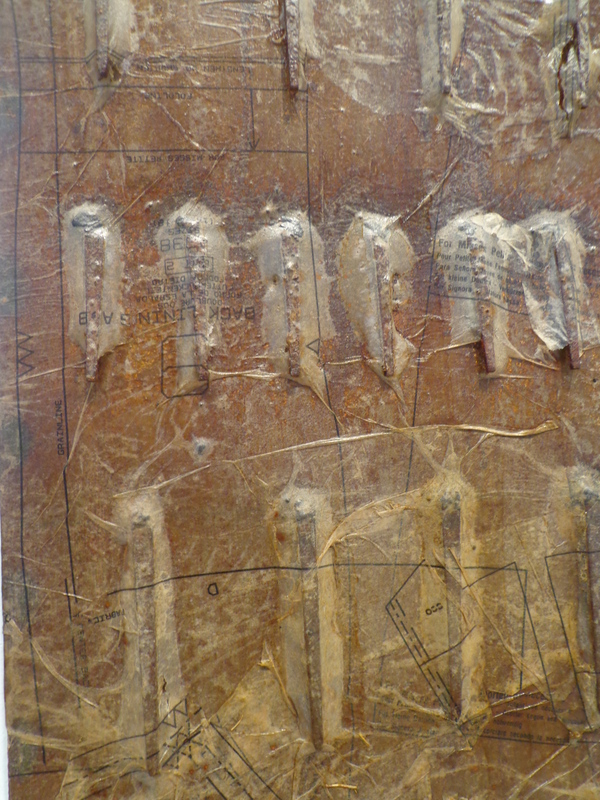 Although it appears to be mounted on curved wood, the actual surface is canvas and this is clear because the staples holding it in place have not been placed on the underside of the work but are visible round the edge as though to emphasise the painterliness of the work. It is a deceptively simple construction. From the front it seems sort of lozenge shape. But look at it from the side and you can see that not only does it curve outwards at the top and bottom but there is also a reverse curvature so that the right hand red shape – (is it Androcles or the lion?) is no longer is visible because against expectations the plain bulges outwards slightly in the centre. It is a work that really makes you look at it. 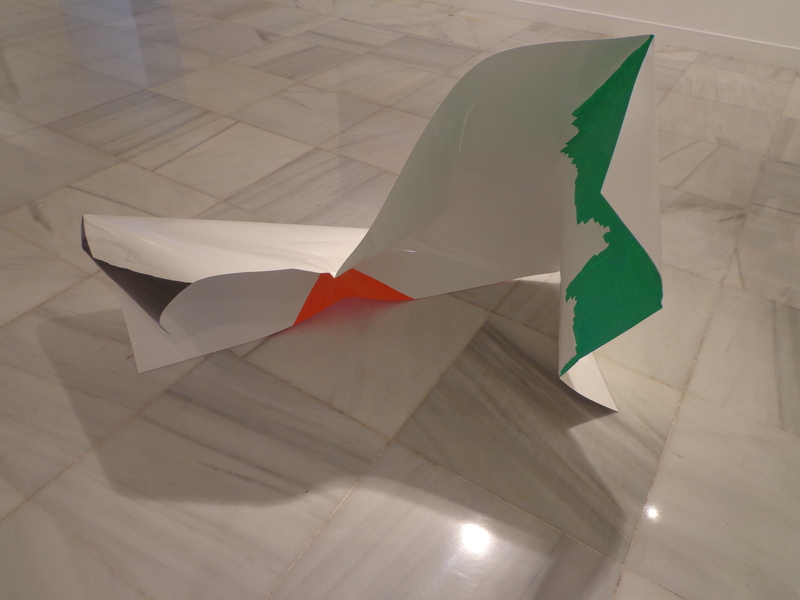 My interest in artists exploring the boundaries between sculpture and paintings means that my choice from Europe was this 2013 sculpture from Spanish artist Carlos Macia Sin Titulo No 43. What was extraordinary about this work was that it looked just like a large piece of glossy folded paper, perhaps a poster. Indeed, so much so, that I surreptitiously fingered an edge just to prove to myself that it was made of metal, though reason told me that it must be. I later saw somebody else do the same.The way that Marcia managed to encapsulate paper-like qualities even down to the way that it sagged in places was extraordinarily clever. I thought of the old art school maxim about honesty of materials. And not so long ago I was told you can’t paint a sculpture. 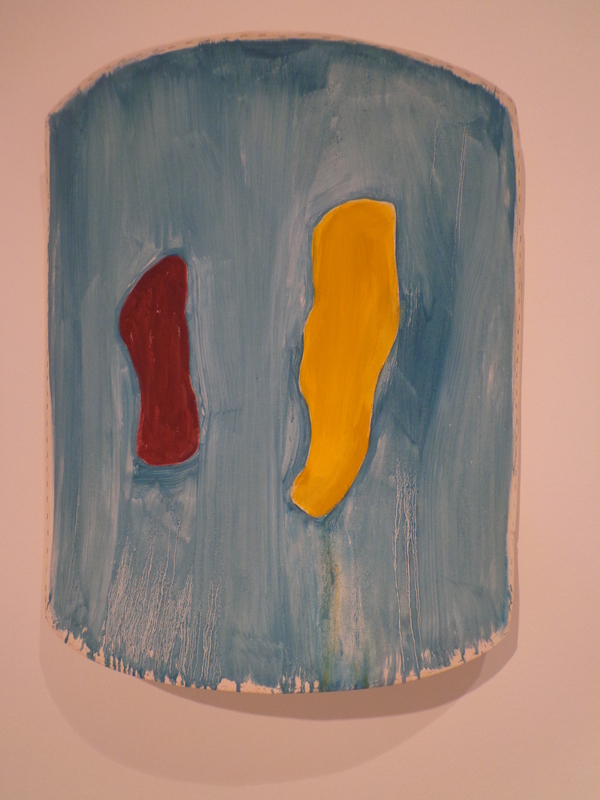 What was interesting here was the dishonesty of the material and the splashes of painted colour. It just goes to prove that there are no rules in art that can’t be broken.